This footpath is no longer a right of way. It was closed in 2006. 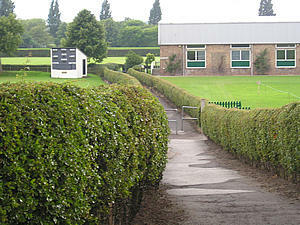 The Countryside and Rights of Way Act 2000 allowed schools to request the closure of public routes through school grounds, and St Peter's School took advantage of this legislation to close this route. It's a decision which benefits a small number of relatively privileged people, to the detriment of the majority. It still seems wrong, five years on. 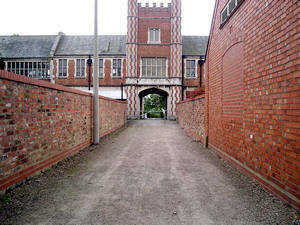 The buildings of St Peter's School look much older than they are. The medieval-looking stone building on Clifton was built in the middle of the 19th century, while this red-brick one was built in the early 20th century. 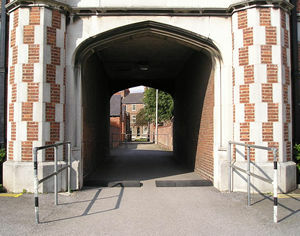 The school applied for a closure order in the summer of 2004. 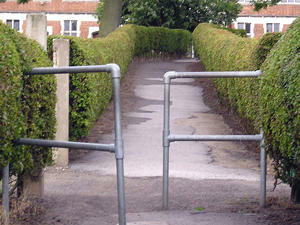 After a public inquiry the closure order was approved, despite protests from York residents. In requesting the closure of this right of way, the school was taking advantage of the Countryside and Rights of Way Act 2000, which allows schools to request the closure of such public routes to protect pupils and staff from criminal acts. It is a matter of concern if the school has been experiencing problems with criminal activity. But then so have the rest of us, and residents who objected suggested that closing public footpaths isn't the answer. St Peter's School governors were concerned about anti-social behaviour. Anti-social elements exist within the school too – as emails received by this webmaster showed, during the campaigns against the closure. On the corner where this footpath meets another (see Clifton footpaths – part 2), there's a stone, just inside the hedge, carved with the words "Rawdon's Boundary". 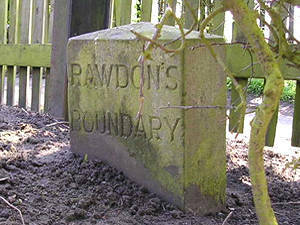 I'm afraid I can't tell you who Rawdon was, and why his/her boundary is marked here. I must have walked past it many times over the years, unaware of its existence. Thanks to Tom for finding the stone, hidden in its corner behind the hedge. See Clifton footpaths – part 2, and Bits of Clifton. Page compiled in summer 2004. Last updated: 16 October 2011.